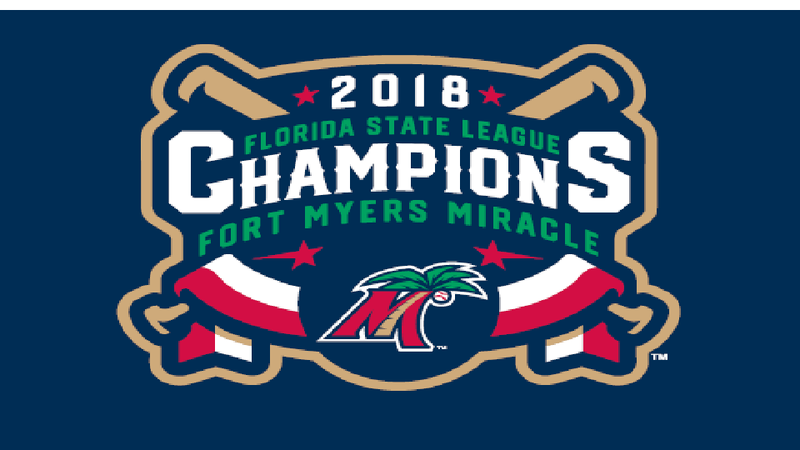 FORT MYERS, Fla. - The 2018 Florida State League Champion Fort Myers Miracle and Minnesota Twins announced today that they have agreed to a four-year extension of their Player Development Contract and a continuation of their relationship regarding Spring Training through the 2022 season. The Miracle are the Class-A Advanced Affiliate of the Twins and have been affiliated with Minnesota since 1992. Their 2018 FSL title was the second in five years for the franchise. Fort Myers plays its home games at Hammond Stadium at the CenturyLink Sports Complex, the Spring Training home of the Twins. "We are extremely excited to continue our over 25-year relationship with the Minnesota Twins," Miracle General Manager Chris Peters said. "The Twins and Miracle have been a cornerstone of the Lee County and Southwest Florida community due in part to our year-round presence. From the Pohlad family, to Dave St. Peter, and the baseball operations staff in Minnesota, the Twins are a first-class organization to work with. We are eagerly anticipating 2019 Spring Training and the opportunity to compete for back-to-back championships with the Miracle as well." "The Twins farm system is filled with a lot of talent. We saw plenty of that this season in Fort Myers on our way to the title and are fired up to see what the next wave brings to the Miracle in 2019." The 2018 Miracle were led in the second half by 2016 first round pick Alex Kirilloff, 2017 number one overall pick Royce Lewis, and top pitching prospect Brusdar Graterol. Kirilloff finished with the most extra base hits in all of Minor League Baseball in 2018 and hit .348 with 20 home runs and 101 RBI for the season. Lewis, in his first full season, hit .292 with 14 home runs, 74 RBI, and 28 stolen bases. He added three home runs in the playoffs to lead the Miracle. Graterol posted a 1.54 ERA over his final seven starts and hit as high as 101 mph on the radar gun. "The Twins are very happy to continue our strong relationship with the Miracle," Director of Minor League Operations Jeremy Zoll said. "Chris Peters and his staff do a terrific job of supporting our players and coaching staff in every way they can. We play at one of the best stadiums in minor league baseball with top of the line facilities. We look forward to strengthening our bond with the Miracle even more in the coming years." Twins Spring Training opens on February 23, 2019 against the Tampa Bay Rays. The Miracle begin their season on April 4, 2018 against the Charlotte Stone Crabs.